Roger Bacon (AKA Doctor Mirabilis, meaning "wonderful teacher") (1214 - 1294) was a 13th Century English philosopher, scientist and Franciscan friar of the Medieval period, and certainly one of the most eminent scholars of the times. Inspired by the works of early Muslim scientists like Avicenna and Averroës, he is sometimes credited as one of the earliest European advocates of Empiricism and the modern scientific method (although later studies have emphasized his reliance on occult and alchemical traditions). He decried the prevailing Scholastic system, based as it was solely on tradition and prescribed authorities. Roger Bacon was born in Ilchester in Somerset, England, possibly in about 1220, but more likely in 1214 (the date depends on how literally a later statement of Bacon's is interpreted). His family appears to have been well-off, but, during the stormy reign of King Henry III of England, their property was despoiled and several members of the family were driven into exile. He studied at the Franciscan school at Oxford which, even in the 13th Century, was rapidly becoming one of the pre-eminent educational centers of Europe. Later, he became a Master at Oxford, lecturing on Aristotle, and he was greatly influenced by the Oxford masters and professors Robert Grosseteste, Adam Marsh, Richard Fitzacre and Edmund Rich and the French mathematician and scientist Pierre de Maricourt. There is no evidence he was ever awarded a doctorate (the title Doctor Mirabilis was posthumous and figurative). Sometime between 1237 and 1245, he began to lecture at the University of Paris, then the undisputed center of intellectual life in Europe, where he was apparently received with applause as the equal of Aristotle, Avicenna or Averroës. In about 1256 he became a Friar in the Franciscan Order, (his whereabouts between 1247 and 1256 are not clear), and as such no longer held a teaching post. Through his acquaintance with Cardinal Guy le Gros de Foulques (who became Pope Clement IV in 1265) he managed to circumvent the restrictions on Franciscan Friars from publishing books or pamphlets without specific approval. The new Pope even ordered Bacon to write to him concerning the place of philosophy within theology, and Bacon's response was his huge "Opus Majus" of 1267. His friend and protector Pope Clement IV died in 1268 and, at some time between 1277 and 1279, Bacon was briefly placed under house arrest by Jerome of Ascoli, the Minister-General of the Franciscan Order. This was probably on the grounds of the Bishop of Paris' Condemnations of 1277, which banned the teaching of certain philosophical doctrines, including deterministic astrology and the works of Aristotle, but possibly also due to Bacon's continued dissemination of Arabic alchemy, and his protests against the ignorance and immorality of the clergy. Sometime after 1278, Bacon returned to the Franciscan House at Oxford, where he continued his studies until his death in 1294. Bacon died without any important followers, was quickly forgotten, and remained so for a long time until his works were rediscovered and published in the 18th Century. Bacon called for a radical reform of theological study, with less emphasis on the minor philosophical distinctions that Scholasticism pursued, and more of a return to the study of the scriptures and the classical philosophers in their original languages. He urged theologians to study all sciences closely, and strongly championed experimental study over reliance on authority, and was an enthusiastic proponent and practitioner of the experimental method of acquiring knowledge about the world. Always direct and outspoken, he openly criticized his much-admired contemporaries Alexander of Hales (c. 1183 - 1245) and Albertus Magnus as mere preachers who had not fully studied the philosophy of Aristotle. Bacon was fluent in several languages (unlike most of his contemporaries) and lamented the corruption of the holy texts and the works of the Greek philosophers by numerous mistranslations and misinterpretations. He also argued that, under the prevailing Scholastic system, physical science was not carried out by experiment, but by arguments based solely on tradition and prescribed authorities, rather than by the initial collection of facts before deducing scientific truths as Aristotle had taught. 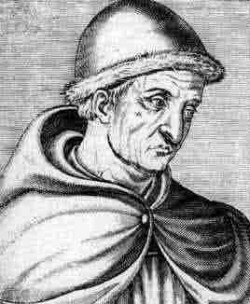 Bacon's most important work was the "Opus Majus" (Latin for "Greater Work"), written in Medieval Latin at the request of Pope Clement IV in 1267. This was a huge, 840-page treatise in seven main sections, ranging over all aspects of natural science, from grammar and logic to mathematics, physics, and philosophy (and particularly his views on how the philosophy of Aristotle and the new science could be incorporated into a new theology). It contains detailed treatments of mathematics, optics, alchemy, the manufacture of gunpowder, astrology and the positions and sizes of the celestial bodies. It anticipates later inventions such as microscopes, telescopes, spectacles, flying machines, hydraulics and steam ships. However, it should be remembered that Bacon was also a Franciscan monk, and the work was also a plea for reform addressed to the Pope, and was designed to improve training for missionaries and to provide new skills to be employed in the defense of the Christian world against the enmity of non-Christians and of the Antichrist. It was followed later the same year by a smaller second work, the "Opus Minus", which was intended as an abstract or summary of the longer work, and then by the "Opus Tertium", intended to complement the other two and expand on some sections which had only been covered cursorily (unfortunately, over half of this work has been lost). In addition, he had planned to publish a comprehensive encyclopedia, although only fragments ever appeared. Bacon is the ascribed author of the controversial alchemical manual "Speculum Alchemiae" (later translated into English as "The Mirror of Alchemy"), and possibly (although less likely) also the mysterious encrypted "Voynich Manuscript". Bacon performed and described various experiments which were, for a time, claimed as the first instances of true experimental science, some five hundred years before the real rise of science in the West, and his popular image is as an isolated figure in an age supposedly hostile toward scientific ideas. However, this interpretation (of both Bacon's work and of the prevailing medieval attitudes to science) has been challenged more recently, and he has been portrayed more as a brilliant and combative (if somewhat eccentric) scholar, endeavouring to take advantage of the new learning which was just then becoming available, while still remaining true to traditional notions and attitudes, and not as isolated as had been supposed. Roger Bacon's Philosophy of Nature: A Critical Edition, with English Translation, Introduction, and Notes, of De multiplictione specierum and De speculis compurentibus.